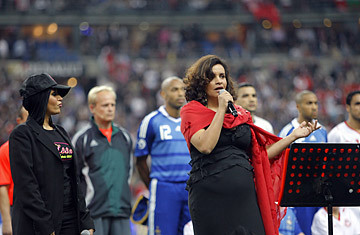 Tunisian singer Amina sings the Tunisian anthem before a soccer match between France and Tunisia. She is watched by Laam, a singer of Tunisian origin who, while singing the French national anthem was booed by fans at the stadium. The stock market is tanking again; a global recession looms; and intelligence services report that al-Qaeda is stronger and more determined to strike than ever. But Wednesday found the leaders of France with a more important crisis to confront: the excruciating insult of hearing France's national anthem lustily jeered by the crowd at the opening of a France-Tunisia friendly match in Paris the previous night. The impact of a few hundred fans booing and whistling during the playing of La Marseillaise, traditional before an international match, could be measured by the outpouring of rage from scandalized French politicians. They were falling over one another to express outrage and find effective sanctions against those responsible, and deterrence against any recurrence. Ironically, it took the politicians longer to give coherent expression to their anger over the greed-driven global financial crisis than it did to excoriate some rambunctious soccer fans. But Sarkozy was just getting started. Following a virtual crisis meeting between the President and concerned cabinet members, Health and Sports Minister Roselyne Bachelot-Narquin grimly declared the decision had been taken that "any match during which our national anthem is whistled will be stopped immediately". And when that happens during friendly matches, she intoned, such fixtures against "the country concerned will be suspended for a period yet to be determined"  though that risks leaving France with no one to play with should booing suddenly become a pre-game fad here. Worse still: French Interior Minister Michele Alliot-Marie on Wednesday night announced she'd ordered video footage of crowd shots be used to identify booers as evidence to try perpetrators in a court case for bringing "insult to the national anthem". So much for liberte. But those remedies may be missing the cause of the problem. Most of the booing came not from visiting Tunisians, but from fans born and raised in France. Such booing has come to be used by ethnic-Arab French soccer fans to protest the racial, social and economic discrimination suffered by those not fortunate enough to be among the stars of les Bleus. It's hardly coincidental that previous outbreaks of anthem booing (and resulting expressions of indignation by politicians) occurred before a France-Algeria match in 2001, a France-Morocco game in 2007, and a 2002 French Cup final orchestrated by fans of pro club Bastia, who defiantly played up Corsica's reputation as being France's non-Arab "enemy within". The Corsican exception apart, booing France's anthem has become an effective tactic for drawing attention away from the largely black and Arab faces that defend France's honor on the soccer field, and back to the communities from which they come in the decrepit housing projects surrounding the Stade de France and other suburban stadia. On Tuesday night, the protest carried a sharper edge, given the fact that the anthem was being sung by Franco-Tunisian R'n'B artist Laam, whose own childhood was marked by poverty and hardship. But if the whistling during the anthem was a form of protest, the perpetrators would have awoken disappointed on Wednesday, as they found themselves subjected to a torrent of outrage. "Those who want to [jeer] a national anthem should be banned from the matches they've come to watch," scolded French Prime Minister François Fillon. "Let's just stop organizing these kinds of matches so these kinds of people will be deprived their team," added secretary of state for sports Bernard Laporte, former coach of France's national rugby team that has also been the target of some Bronx cheering lately. "We can no longer tolerate French players being [booed] incessantly, or the Marseillaise being [jeered]." Given that the very purpose of the boo-boys is to get under the skin of French officialdom, a more effective response may be to feign indifference in order to rob the slight of its intended impact. In fact, a significant portion of the booing has little to do with politics at all  it's the reaction of white French soccer fans to the parlous state of the national team, and failure of an unresponsive establishment to rectify it by firing the widely loathed national coach, Raymond Domenech. "I always boo La Marseillaise, just for the fun of watching the tight-asses wig out," says a 38 year-old, long-time, lilywhite French football fan who asked to be identified only as 'Foot-ex' in order to avoid any retribution. "It's harmless, but effective. Just look at the reaction today. You'd have thought the economic crisis had gone away!" See TIME's pictures of the week here.